People are used to being asked to help save photogenic pandas, but are there animals whose strange appearance hinders conservation? Creatures that achieve world fame for being under threat - the panda, the mountain gorilla, the tiger - tend to be conventionally aesthetically pleasing, even cute. But the scientists who study the planet's rarest beasts say that many of the most precious and threatened creatures have physical characteristics that, although perhaps not adorable in the most orthodox sense, make them truly unique. A project run by the Zoological Society for London (Evolutionarily Distinct and Globally Endangered) is trying to raise awareness of these less appreciated creatures. "I love all the species on the Edge list," says Carly Waterman, director of Edge. "But I think some do need a little extra help to get them a place in hearts of the general public." Here are a few of the less doe-eyed and fluffy and more spiky, scaly, big-nosed and slimy animals that might be conservation icons. This extraordinarily long-nosed, sharp-clawed character is the oldest surviving mammal in the world. 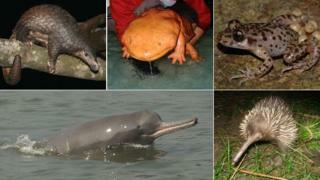 It is a one of just three egg-laying mammals, or monotremes - a group that includes the duck-billed platypus. It has been around for 120 million years. "A lot of medical researchers would like to reveal the secrets of their success," says Dr Peggy Rismiller from the University of Adelaide in Australia. Rismiller has studied echidnas since the 1980s and says that if scientists could closely examine their biology, "we might be able to learn from them". What makes an animal an icon? The most successful approach for raising support [for species conservation] is to choose species based on their popularity. Bumblebees and garden birds, for example, are popular because people interact with them so regularly. But different rules apply when selecting animals for international conservation campaigns. People have little direct experience of the species and prefer looks over personality. Our recent research showed that most iconic species shared the same two features. Most are large, because people find bigger animals more impressive, and have forward facing eyes, because their faces more closely resemble those of humans. Should animals have the same moral rights as humans? But their rarity and shyness makes this close examination incredibly difficult. Long-beaked echidnas are found only in Papua New Guinea, where they use their beaks to dig in wet soil for earthworms. They became extinct in Australia about 20,000 years ago, as the climate dried out the mud they needed in order to excavate and eat. The few researchers who study the elusive beasts are particularly intrigued by their remarkably large brains. Half of an echidna's brain is made up of neocortex - the so-called grey matter that allows mammals to reason, learn and remember. A human brain is about one third neocortex. Frustratingly though, their apparent cleverness makes them even trickier research subjects. When Rismiller and her team attached radio transmitters to short-beaked echidnas in order to study their movements, they noticed that the animals would listen out for sounds from the researchers' radio receivers. "They recognise the sound their own transmitter makes," says Dr Rismiller. "And if they hear it, they make a run for it." Another big-nosed mammal that doesn't feature in many conservation campaigns is the Ganges river dolphin. It's a stocky freshwater dolphin with a long beak that displays its large, very visible teeth. Like most river dolphins, this species has little need for vision in the muddy waters it inhabits, so it has tiny, non-functional eyes. Nadia Richman from the Institute of Zoology has studied the animals for three years. She says that the Ganges river dolphin is the "last remaining, widespread top predator in freshwater systems in Bangladesh, India and Nepal". "It is the most evolutionarily distinct toothed whale so to lose this species would mean losing a considerable amount of evolutionary history." Richman admits that their appearance "can be somewhat off-putting". "But once you get to know their character you realise there is a very 'cute' element to them. "The local people in Bangladesh call them uchu mach which means jumping fish in Bangla [Bengali], and on the rare occasion you can see their heads, they always have a smile." Pangolins are the only mammals in the world to be entirely covered in scales. They are covered in overlapping horny scales that are made of keratin - like rhino horn or human finger nails. Their scales and a misplaced belief in their therapeutic value has unfortunately driven a huge demand, which is driving the Sunda pangolin to extinction. Pangolin scales are used in traditional Chinese medicine - sold with the claim that they tackle a long list of ailments, from helping breastfeeding mothers lactate to curing cancer. But there is no evidence that the scales help with any human complaint. Dan Challender from the University of Kent is studying pangolins for his PhD. As well as their unique appearance, he says, the animals are incredibly strong and flexible. "They're extraordinary gymnasts," he said. "I've seen mothers climbing upside down on the ceiling while the baby clings on to her back. As for why the wider public has not taken the pangolin to their hearts, he says they just need a bit of exposure. "I just don't think people are aware of these animals," he says. "They just so funky - when people see footage of them, they fall in love with them." Image caption Could you fall in love with a pangolin? The Chinese giant salamander is the largest salamander species in the world. It can grow up to 1.8m in length. There are just three species of giant salamander, Waterman explains. "[This] lineage has been evolving independently from other amphibians for 170 million years. The creatures are certainly not classically beautiful. The Arkive website - a resource providing images, zoological descriptions and footage of wildlife - explains that their "skin is dark brown, black or greenish in colour and irregularly blotched". "It is also rough, wrinkled and porous which facilitates respiration through the skin as this large amphibian lacks gills." But Waterman says the giant, slippery beast, which loves clean, cold water, could be an icon for the protection of waterways. The Chinese government attempted to draw attention to the plight of this species by putting 15 of them on display at the world expo in Shanghai in 2010. Unfortunately, according to a report in China's Global Times, all 15 animals died "as a result of the hot weather and noisy environment". "It's not as bright as dart frogs, green like Kermit, or as stately as Jeremy Fisher or Toad of Toad Hall," says Trent Garner at the Institute of Zoology, who has studied these toads for five years. "But it is a lovely frog with loads of personality." The Mallorcan midwife toad was only discovered in the 1970s, and then only its fossilised remains were discovered. The species was first spotted alive just years after this discovery, and this triggered a captive breeding and reintroduction programme. The world's first successful cloning of an endangered species was led by Pasqualino Loi and fellow scientists from the University of Teramo, Italy in 2001. They cloned the mouflon - one of the world's smallest sheep, which is found in Sardinia, Corsica and Cyprus. The guar, a rare wild ox, was the first endangered species to be cloned by putting the DNA of one species into the eggs of another. Robert Lanza and colleagues at Advanced Cell Technology, Massachusetts took skin cells from a dead gaur and fused them with cow eggs. The clone, known as Noah the gaur, lived for 48 hours. Sadly, explained Dr Garner, evidence suggests that the reintroduction programme also introduced the amphibian chytrid fungus to the island and the species. This, he says, was no fault of the project. "They were screening for every infectious disease known to be a threat to amphibians," he explained. "Unfortunately [chytrid] had not yet been described when the re-introductions were underway." Amphibian conservationists throughout the world are now battling against the deadly chytrid fungus, so Dr Garner hopes that the plight of this little toad could draw attention to this cause. As for the toad's unique selling point as a conservation icon, the scientist says the males are very good dads. "They carry the fertilised eggs and care for them until hatching," he explained. "[And] the Bambi-like eyes alone should make the public swoon."